What? 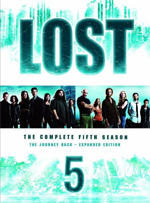 is it time for the Lost Complete Fifth Season DVD set already? My, how the time flies... and boy-howdy does the time fly out there on Lost Island... forward, backward, sideways. You name it. In fact I feel a time-warp flashback coming on like a kidney stone right now. A long time ago, in the Move Habit review of Lost season one, I compared Lost to a roller-coaster ride: fun, but it goes nowhere. By season two, the ride had matured to a Roller Coaster Experience: larger, flashier, louder, more adult. By season three, Lost had become a smoking crater. It was a place where a TV show had once stood but was now a pile of debris and twisted story lines. Season four was like watching Niagara Falls: full of sound and fury and signifying nothing, a natural wonder carried on by its own inertia (but an impressive site none the less). My metaphor for Season 5 will be that of the walking undead and not just any old zombie but one that is a drunk that’s fallen off the wagon. Lost died long ago. And yet it didn’t die. I have to admit that at first season five started to pull me back in. As with season four, I’d not seen the original broadcasts so it was all coming as new material and I thought some of that old Lost magic had returned. But as is the case with the undead, something didn’t smell right. Maybe the shambling walk or the way the skin hangs tells you that this isn’t a regular person. So too with Lost. It looks like drama but you soon realize that it’s just going through the motions. And like the undead, it wants to eat your brain. I was encouraged that the writers seemed to have sworn off the stultifying flashbacks that had besotted the previous season’s efforts. But that encouragement died quickly. Like failing sobriety, the backsliding begins subtly... what’s wrong with just a glass of Cabernet Flashback with dinner? A little time-travel to set up narrative arcs and fill in the back stories. Then there’s a wholesale transport of the cast back 30+ years and Lost starts to look like That ’70s Show. And before you know it the only people traveling back in time are the audience and the air is thick with back story. One common theme in the flashback bender has been the “troubled and lost youth” of several of the cast. That, along with the ’70s themes makes me wonder if Lost is being written by and aimed at the greying Gen-Xers who remember a golden past before Reagan and Family Ties. Throw in the back-stabbing by treacherous parents and the incessant lying (a Lost staple) and you’ve got lots of psycho-fodder for future generations of Sociologist PhDs studying the last days of broadcast TV. Meanwhile the mythical Jacob weaves away (get it? “fabric of time”?) and is pressed into service of the plot to bring the multiple loose ends together. Can you say “deus ex machina”? Can the team of writers smell the stable? Can we go home now? The whole Lost experience could be summed up in the final moments of the last episode of Season five. Julia lies bleeding and broken at the bottom of a deep hole with wreckage all around. She’s banging on a bomb with a rock in her hand and trying to end it all. But it won’t end. There’s still season six. Hands down, the best part of the Lost Season 5 set is the “Mysteries of the Universe” faux ’80s infotainment documenary. If you are a fan of filmmaker Craig Baldwin’s work (see Tribulation 99, reviewed elsewhere on Movie Habit) this is a must see. Is it me, or has Hawaii lost some of its luster? For some reason this season’s photography isn’t as gorgeous as the previous years. I’ve saved the best news for last. It turns out that the 40-minute-long Lost episodes are perfect viewing while grinding away on a stationary bike. They have just enough action to keep your attention yet do not require much thought which is good for the oxygen starved brain. Who cares if it’s another flashback? You’re just sitting there furiously peddling round and round and going nowhere. Hey, another Lost metaphor! But watch out for that last episode... it’s a double length one.